K-9s Count supports local K-9 units with training and necessary equipment for their dogs. 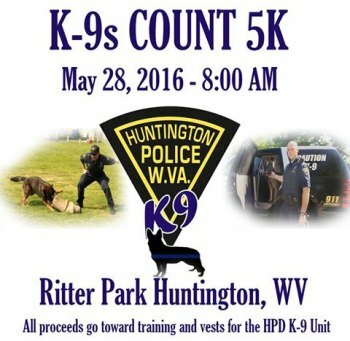 This year's Huntington 5K will be supporting the Huntington, WV Police Department's K-9 Unit. The mission of the Huntington Police Department is: "To provide the highest level of professional police service while preventing crime through problem solving partnerships." The K-9 program is of vital importance to meeting the mission of the Huntington Police Department. The K-9 program is responsible for assisting officers with suspect aprehension, evidence searches, and narcotics detection and investigation. 100 percent of the money raised by K-9s Count stays in the Tri-State area and will be to provide training and safety equipment to the HPD K-9 unit; of particular interest bullet and stab proof vests for the K-9s themselves. Sign Up at: http://www.tristateracer.com/event.php?RaceID=8167. — with Huntington Police Department.